This semester the UGA Collection of Arthropods is buzzing with activity. Under the direction of Dr. Joe McHugh, six museum interns are participating in LepNet (The Lepidoptera of North America Network), an NSF-funded specimen digitization project. 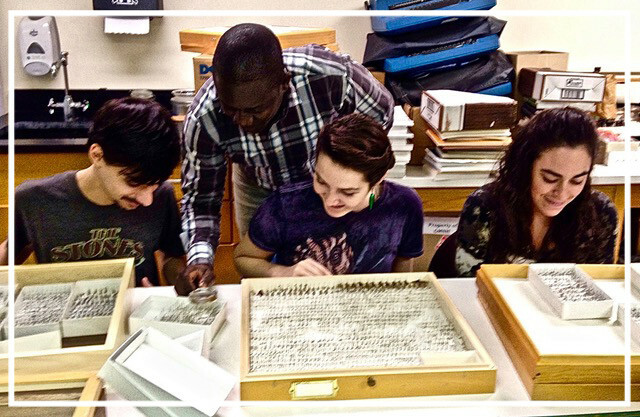 Our interns are systematically working through the Museum’s holdings of butterflies and moths, entering collection data for each specimen into an on-line database. By doing so, they are taking individual bits of biological information that is stored on tiny labels pinned to each specimen and making them globally available in an easily accessed format. The LepNet project includes 27 collaborating research collections that will digitize at least 1.7 million specimen records which will be added to an existing 1 million records, building an enormous electronic resource of biological information about butterfly and moth species, including their distributions, host plants, phenologies, and habitat preferences, as well as any changes in these characteristics over time. A second stage of the LepNet project will involve taking photographs of many of our Lepidoptera specimens and uploading those images to the database entries for particular specimens. This will build a strong digital record of the phenotypic diversity of the species. The photographs also will be used to “train” a software package that is being developed by LepNet to identify butterfly and moth species from photos of specimens.